Here’s another freebie for your pets today! 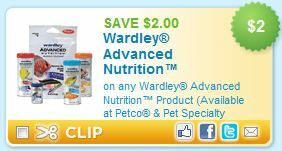 Print out a coupon for $2/1Wardley Advanced Nutrition Products from coupons.com (Under pet care). These sell for about $2 at Walmart and Pet Stores so free fish food! https://i0.wp.com/savvywifehappylife.com/wp-content/uploads/2011/01/WardleyFishFoodCoupon.jpg?fit=282%2C151&ssl=1 151 282 Brandi https://savvywifehappylife.com/wp-content/uploads/2016/09/SavvyWifeHappyLife-logo-2.png Brandi2011-01-07 14:55:302011-01-07 14:55:36Free Fish Food! Freebies for the Pets! Free Mini Box of Tissues!